Let them find you! Promote your business to an international community of more than a million outdoor enthusiasts looking for hiking and cycling trails in your area. 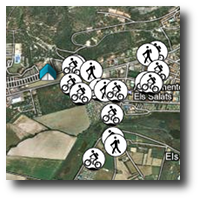 Now, for only 30.19€/year you can show your business for a year on the map of trails nearby. You can update your information at any time and visitors can contact you directly! Includes an option to display a map on your website with the best trails close to your business! in recognition for our innovation, technology and dedication to sustainable tourism, elements we strive to reflect in our products.